Come visit Crufts at the NEC Birmingham, Stand 50, Hall 1! For Puppy Massage DVD, Photizo and IAAT. Crufts starts tomorrow. One of the biggest dog shows in all the world, and worth a visit even if you only go for the shopping! Any dog lover can buy anything you could dream of there. There is discounts and information, so you can also learn about the many valuable canine welfare and education organisations. Photizo have a stand. Stand 50, Hall 1. 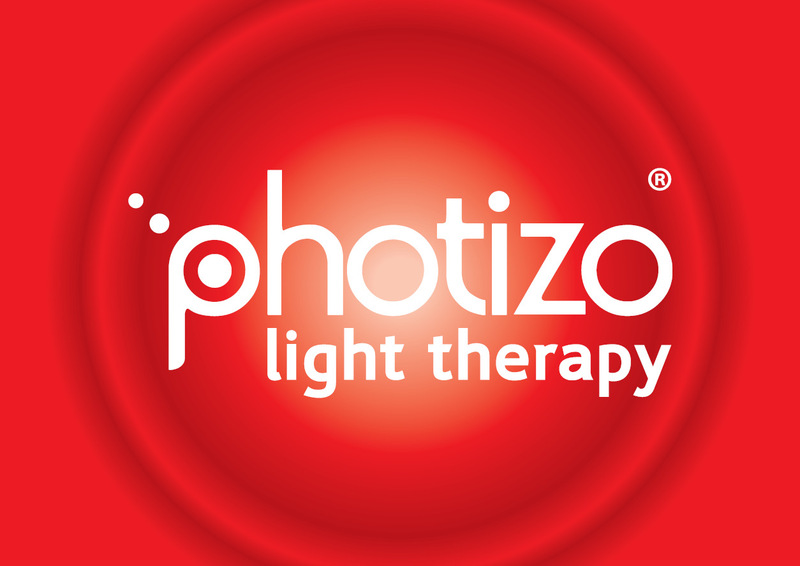 There you can meet Ruth and get your own Photizo vet, or come and learn about how their red light therapy works. They are one of our Puppy Massage DVD stockists, so you can get your own copy from them. Get there quick though to avoid them running out. allowing them to represent themselves on the stand. IAAT is the International Association of Animal Therapists and they represent musculoskeletal therapists all over the world. We are members of this organisation and we will be there Sunday to help represent them. There will be people from this organisation every day, and Donna, founder of Animal Physiotherapy Ltd will be there on Sunday too, so pop along to say hello and we can answer any questions you may have. Crufts is only on once a year and runs from 9th -12th March so don't miss it! To get to the NEC the NEC is served by the M6 and M42 motorways and there are extensive car parking facilities on site. For the convenience of the public, shuttle buses operate from the car parks to the main entrance. For SatNav users the NEC postcode is B40 1NT. We are so pleased to see an article in the VN Times! Crowd Funding Accomplishment; and DVD case study about our story. They very kindly help space for this story, and its now in print for the world to see. Here is the article before it went to the VN Times. Just over 1 year ago I started a crowd funded project through Kickstarter to raise funds to film my Puppy Massage DVD. 16 months and a lot of hard work later, after a successful campaign, it’s here! In April 2015 I wrote an article telling everyone about my crowd funding, and what a wonderful way it is to raise funds to bring your own idea to life. I am pleased to say my campaign was a huge success and 45 days later I raised 134% of the goal I had set. My backers came from far and wide. One was from Japan, two from California, many were clients of mine, and some were past colleagues and employers. I was amazed to see the people found my project to fund from overseas and that I had never met these people before. 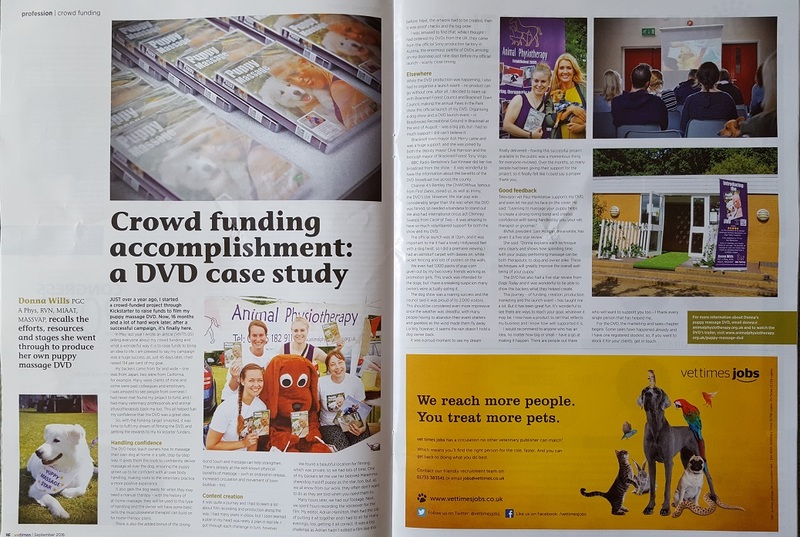 I had many veterinary professionals and animal physiotherapists back me too which all helped fuel my confidence that this DVD was a great idea. So now I had to fulfil my dream of filming the Puppy Massage DVD and getting the Backer rewards to my Kickstarter funders. The Puppy Massage DVD helps teach owners how to massage their own dog at home in a safe, step-by-step way. It gives them the tools to confidently deliver massage all over the dog ensuring the puppy grows up to be confident with all over body handling. This makes visits to the vet a more positive experience. It also gets the dog ready for the future as they may need a manual therapy, and this way they will be used to this type of handling and the owner will have some basic skills that the musculoskeletal therapist can build on for home therapy plans. There is also the added bonus of the strong bond that touch and massage can help strengthen. We of course already know all the physical benefits of massage like endorphin release, increased circulation and movement of toxin build up. It was quite a journey and I had to learn a lot about film recording and production along the way. I had many plans in place but I soon learnt that a plan in my head was very much more difficult in real life. But I got through each challenge in turn. We found a beautiful location for filming, which was private so we had lots of time. One of my backers let me use her beloved Moremma puppy as the star, but as we all know from our work, they often don’t want to do as they are told when you need them to! Many hours later we had our footage. We then had to spend hours recording the voiceover for the film. My editor, Adrian Hamilton, then spent many hours putting it all together, and I had to sit there for many evenings too, to get it all correct. It was a big challenge as he hadn’t edited a film like this before. Then the artwork had to be done and finally the proof checks and the big order. I was amazed to find that although I thought I had ordered my DVDs from the UK, they actually came from the official Sony production factory in Austria. My enormous palette of DVDs arrived on my doorstep just 9 days before my official launch. Scarily close timing. Whilst all this DVD production was going on I also had to organise a launch event. No product can go without one. I teamed up with my local council, Bracknell Forest and Bracknell Town Council, as they had lost funding for their annual dog show, and so I made the annual “Paws in the Park” show the official launch of my Puppy Massage DVD too. Organising a dog show and a DVD launch event was a big job, but with lots of reward on the big day. The show and DVD launch was on 20th August in Braybrooke Recreational Ground, Bracknell. I had so much support I still can’t believe it. The Bracknell Town Mayor Ash Merry came and was a huge support, she was joined by both the deputy Mayor Clive Harrison and The Borough Mayor of Bracknell Forest Tony Virgo. BBC Radio Berkshire’s Sue Kinnear did her live broadcast from the show. It was wonderful to have the information about the benefits of the Puppy Massage DVD broadcast live across Berkshire. Channel 4’s Bentley the ChiWOWhua famous from “First Dates” joined us and Immy, the Puppy Massage DVD star. Immy was now considerably larger than last year so she needed a bandanna to point her out! We even had an international circus act “Chimney Sweeps” from Circle of Two. It was amazing to have so much volunteered support for my show and my DVD. The official launch was at 12pm and it was important to me that it had a lovely Hollywood feel with a dog twist. So I did a premier viewing. I had an astroturf carpet with daisies on, white picket fencing and lots of posters on the walls. We even had 1000 packs of Pup-corn given out by my two lovely friends working as promotion girls. This was for all the dogs who came to view the premier, though I think many owners were actually eating it. The dog show was a roaring success and the local council were proud of the turnout of about 2000 visitors. This was impressive since the weather was dreadful and many people had to abandon their event shelters and gazeebo’s as the wind was making them fly away. Luckily the rain doesn’t hold a dog owner back. It was a proud moment to see my dream finally come to delivery. It was wonderful to have this successful project available to the public. This was a momentous thing for everyone involved. Over the months so many people have been giving their support or this project, that it finally felt like I could say a proper thank you! T.V. Vet Paul Manktelow had watched he DVD and supported it and even put his face on the cover. He said “learning to massage your puppy helps to create a strong loving bond and creates confidence with being handled by you, your vet, therapist or groomer”. The President of the BVNA, Samantha Morgan had given a 5-star review and said “Donna explains each technique very clearly and shows how spending time with your puppy performing massage can be both therapeutic to dog and owner alike, these techniques will greatly improve the overall well-being of your puppy". The DVD also had a 5-star review from the editor of Dogs Today magazine, Beverly Cuddy who said “Every dog wants their owner to watch this! If only every puppy could grow up loving a human's touch. Donna teaches you how to get even closer to your best friend than ever before." It was of course wonderful to be able to show the backers what they helped create. This journey of funding, creation, production, marketing and the launch event has taught me a lot. But it has been great fun. It’s wonderful to see that there are ways to reach your goal, whatever it may be. I now have a product to sell that reflects my business and I know how well supported it is. I would recommend to anyone who has an idea, no matter how big or small. Have a go at making it happen! There are people out there who will want to support you too. I thank everyone of mine. For the Puppy Massage DVD, the marketing and sales chapter begins. I have made some sales already and I have one registered stockist. If you want to stock the Puppy Massage DVD for your clients, then get in touch. donna@animalphysiotherapy.org.uk or find more information and the trailer at www.animalphysiotherapy.org.uk/puppy-massage-dvd. Paws in the Park in the Paper! We are so pleased to share that Paws Paws in the Park got in the Paper! 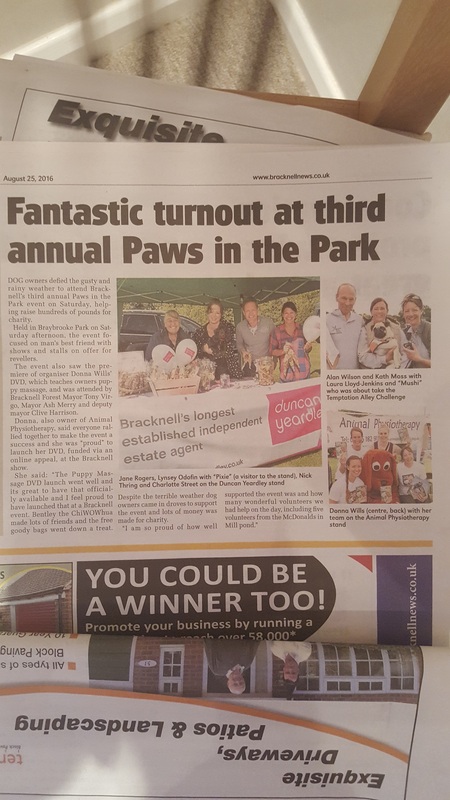 Local Newspaper Bracknell News Printed the story about Paws in the Park and the Puppy Massage DVD Launch in the 25th August 2016 edition. We are so pleased about the media coverage we have had for this event, with BBC Radio Berkshire also broadcasting from the event. What a wonderful day it was for all who came and joined the festivities. There is a great write up about the event, and a lovely photo with Duncan Yeardley, who were major sponsors of this community event. Paws in the Park Show Program and BBC Radio Berkshire as joining us! Here is the line up for the day, Paws in the Park Show Program and BBC Radio Berkshire as also joining us for our fun doggy festivities! Its all so exciting! We are so excited to have so much support for this non-profit community event, that is raising valuable funds for the charities on the day. All businesses have pledged to give 10% of takings on the day to the charity pot, so its a good opportunity to stock up on everything you need. 11-3.30. Braybrooke Recreational Ground, Makepiece Road, Bracknell, RG42 2HG, this Saturday. The show will be opened by Mayor Ash Merry and she will also be judging a competition. This show is in great demand Mayor Tony Virgo, Borough Mayor is also joining us. This fun filled family event is a fun dog show with lots to see and do. Including fun competitions, have-a-go agility and temptation alley! Win rossettes, have a go at the competitions at the stands, for lots more amazing prizes. We have had amazing donations from many businesses including a hamper form Broadreach Nature+ worth £45, a planted flower arrangement, worth £30 from Oakfield garden center, £30 vouchers for Frankie & Benny’s! There are also displays from My Dog’s Den and Click-2-heel and a book reading at the Dodger dog stand! Follow our facebook pages for further information, and see who else is there on the big day! And of course, the World Premier of the Puppy Massage DVD! With FREE Pupcorn! See you there! 11am, 20th August 2016. Event Sponsored by Duncan Yeardley, local family run estate agents. First sale of Puppy Massage DVD in Portugal! Portugal means its officially gone global, with the first sale of Puppy Massage DVD in Portugal! What a proud moment. We had 2 kickstarter backers in California so we knows its in the USA now, so we are so pleased to have so much demand for the Puppy Massage DVD so far and wide. We have also had an enquiry about being a stockist, so this will be the first of many. The puppy massage is well supported as T.V. Vet Paul Manktelow has his picture on the front, and the president of the British veterinary nursing association gave it a 5 star review! See our other pages for more information on the DVD or just order your copy now! Just £10. The official release of the DVD is 20th August at Paws in the Park, Braybrooke Recreational Ground, Makepiece Road, Bracknell, RG42 2HG. Come along and join us at the premier viewing and official launch of "Puppy Massage". We are so pleased to announce that the Edward Foundation Joining us at Paws in the Park 2016. 20th August, 11-3.30, Braybrooke Recreational Ground, Makepiece Road, Bracknell, RG42 2HG. Free entry, Free parking, Free Goody Bag, Free Pupcorn and the launch and premier viewing of the Puppy Massage DVD! The Edward Foundation is holding a stand. "We help bulldogs at risk, every penny raised, every minute spent with them, every mile driven to get them or take them home is done by our 1st class volunteers who do it for the love of the breed." A wonderful and worthy charity to be represented at the show. So come and show your support by joining us all there in just 5 days time! Its this Saturday! £45, a planted flower arrangement, worth £30 from Oakfield garden centre, gifts from Longacres garden centre, food from Burns Pet food, £30 vouchers for Frankie & Benny’s and loads more! Event Sponcored by Duncan Yeardley, local family run estate agents. Getting ready for Paws in the Park 2016 – Only 9 days to go! Getting ready for Paws in the Park 2016 - Only 9 days to go! We are getting ready for Paws in the Park 2016 - Only 9 days to go! We cant believe the preparation needed but we are so proud to be doing it! With the launch and premier viewing of the Puppy Massage DVD. Meet Immy, the Puppy Massage star, Bently the ChiWOWhua, and international circus act, Circle of two. competitions at the stands, for lots more amazing prizes. We have had amazing donations from many businesses including Longacres Garden centre, Burgess pet care, and Seat Treats. We are so pleased to announce that we have Carrington Dog Day-Care Centre joining us at Paws in the Park 2016. Carrington Dog Day-Care Centre is holding a stand. "A professional dog daycare centre serving Bracknell and the surrounding areas. We have 4 acres of secure land for your 4 legged friend to enjoy." This brand new establishment only opened yesterday so what a wonderful way to launch! Come along and join the fun at Paws in the Park. Premier viewing of the Puppy Massage DVD! This fun filled family event is a fun dog show with lots to see and do. Including fun competitions, have-a-go agility and temptation alley! Win rossettes, have a go at the competitions at the stands, for lots more amazing prizes. We have had amazing donations from many businesses including a hamper form Broadreach Nature+ worth £45, a planted flower arrangement, worth £30 from Oakfield garden centre, £30 vouchers for Frankie & Benny’s! Here is Immy the Puppy Massage star coming to Paws in the Park! We are so pleased to share that this DVD has now arrived and is now already for its UK premier launch at Bracknell's Paws in the Park on 20th August 2016. Immy the Puppy star with her own DVD! Come along for watch this educational film and get your own copy, just £10. You can even get is signed by the creator, Donna Wills herself! And meet Immy the Puppy star! Learn to massage your puppy in the comfort of your own home. This DVD is useful for any age dog, but starting them young helps get them used to this type of touch, and of course gets them confident with being handled all over. This benefits you when you may need to treat your own dog at home, or if the vet or therapist needs to treat them in the future. The DVD is supported by T.V. 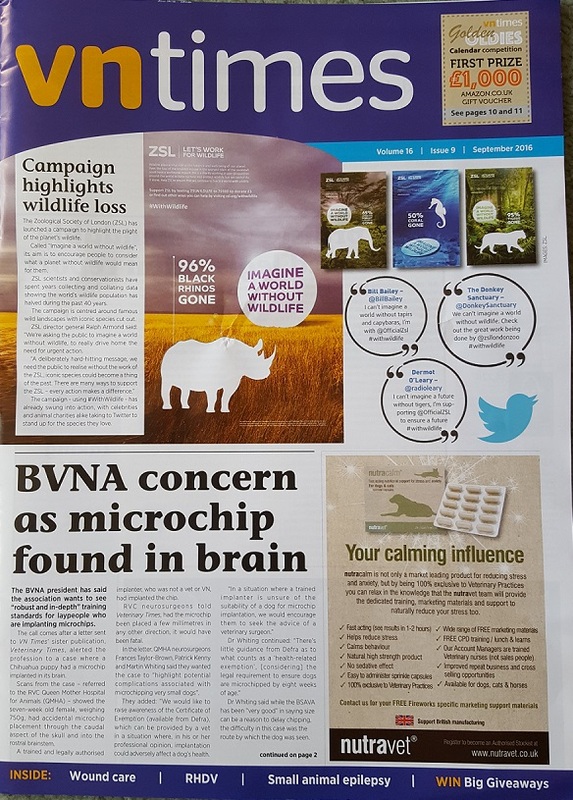 Vet Paul Manktelow and has a 5 star review from the president of the British Veterinary Nursing Association and the Editor of Dogs Today magazine! Donna is a fully qualified animal physiotherapist and veterinary nurse and set up her Company, Animal Physiotherapy Ltd in 2005. Since then she has been the physio for the Pet Spa at Harrods, been on Alan Titchmarch, Sunday Brunch and Daybreak, as well as on BBC London Radio. All of this alongside being the physiotherapist for many large veterinary practices in the South of England. She has also taught animal physiotherapy to many veterinary professionals over the years and written many articles. Venue: Paws in the Park, Braybrooke Park, Makepiece Road, Bracknell, Berkshire, RG42 2HG. 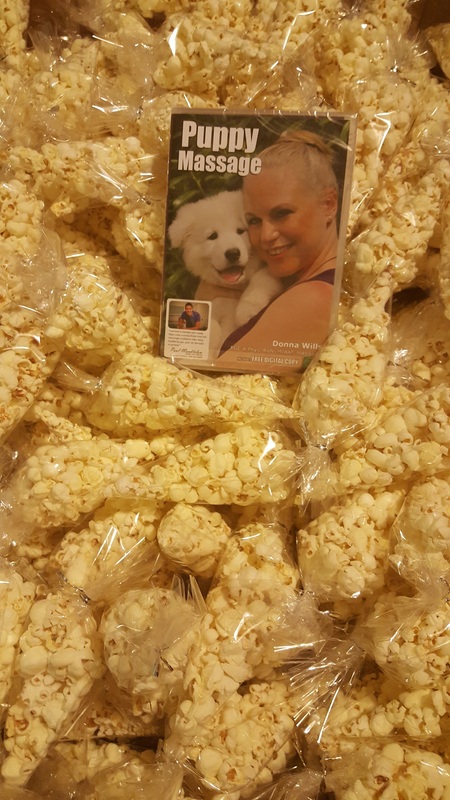 FREE Puppy Massage DVD viewing, FREE Pupcorn, FREE Entry, FREE Parking, FREE Goody bag! 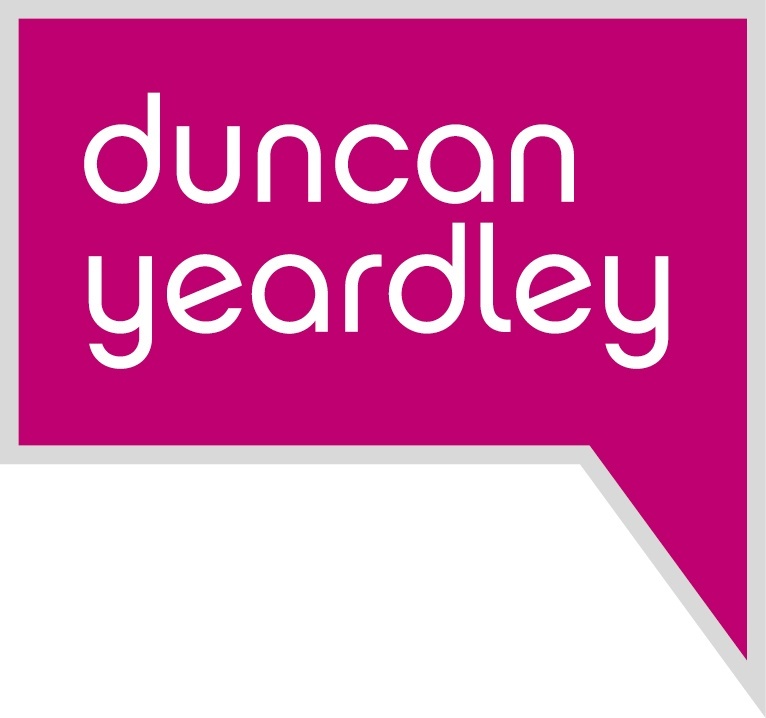 Paws in the Park Sponsored by Duncan Yeardley, Family run local Estate agents. We are so pleased to announce that Beautiful Animal Portraits adding to the FREE goody bag at Paws in the Park 2016. Braybrooke Park, Makepiece Road, Bracknell, RG42 2HG. FREE Entry, FREE Parking, FREE Goody bag, FREE Pupcorn! Tell your friends, and come along! Beautiful Animal Portraits are adding to the FREE Goody Bag. " 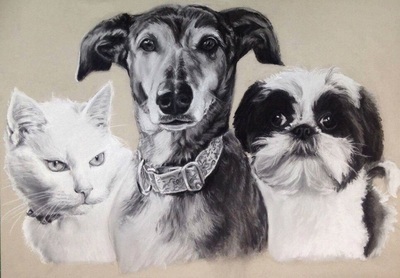 I am a freelance artist specialising in charcoal portraits of animals. I do not require sittings and all my work is 100% hand drawn. All I require to work from is a photo of that special pet you would like transformed into a unique one-off piece of art."